When you happen to delete contacts on your Android phone, it is not easy to recover them. Actually, there is no option in any Android phone which allows you to retrieve lost contacts from Android. In that case, you won’t be able to get those important contacts which you may call or send messages to later on. However, this problem does not end there because there are many applications available on the internet for you to download, allowing you to find all the deleted contacts whether they are deleted intentionally or not. Below are the 2 most downloaded apps which you can use. Android Data Recovery is a desktop application that is compatible with both Mac and Windows PC and works on most Android devices. It allows you to recover your lost files including images, messages, documents, contacts and more. It actually works in different ways. You may recover deleted contacts from Android phone memory and SD card. What’s more, you can preview the items before recovering. Here is how you can use this tool. Step 1: Download, install and launch the application on your PC and then connect your Android phone. 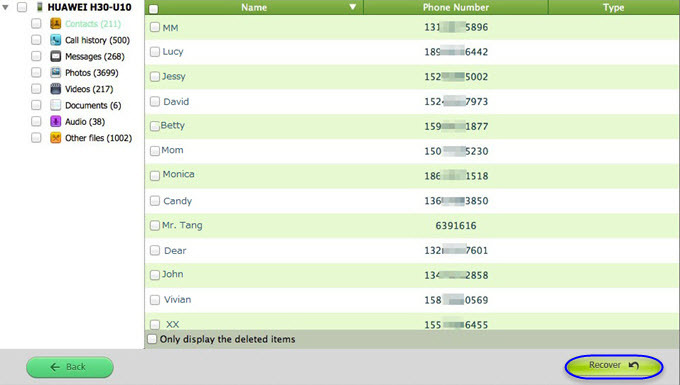 Step 2: Once connected, the main interface will show up and you can select “Contacts”. And then click “Next”. Step 3: You will see some tips, read them and tap “Start”. The software will analyze the device for you. After that, check the contacts that you want to retrieve, and tap “Recover” to get contacts back to your computer. This application is so easy to use, but you need to turn on USB Debugging mode before connecting Android to PC. And it is all right that your phone restarts several times when analyzing and do not pull out the USB cable. This is another helpful software that can help you get back files including contacts, photos, messages, call history, audios, videos and some other documents deleted from your Android phone. Just like the first one, this tool is also compatible with most of the Android devices available in the market. 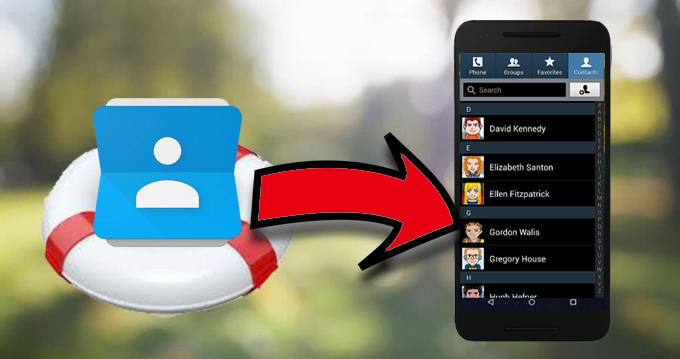 Following is how to recover deleted contacts from Android using Tenorshare Android Data Recovery. Step 1: Download, install and connect your Android device by means of a USB cable or Wi-Fi. Step 2: Click “Find your device” and tap “Connect” once a new window pops up. And then another window will pop up on your phone, tap “Allow”. Step 3: On the computer, click “Start” and choose “Scan contacts, call history and text messages”. Step 4: When the process completes, click “Recover”. After you retrieve lost contacts from Android, it is suggested that you transfer contacts to your phone and start backing up your files using Apowersoft Phone Manager. This will prevent you from getting into trouble. When you back up using this tool, it will allow you to save all your files on your computer or any other storage device that you want to use. There is nothing to worry about because the device is very safe and easy to use. It will definitely take less of your time than doing the recovery process above and will serve as your safety precautions in the future. To use it, just click the button below.